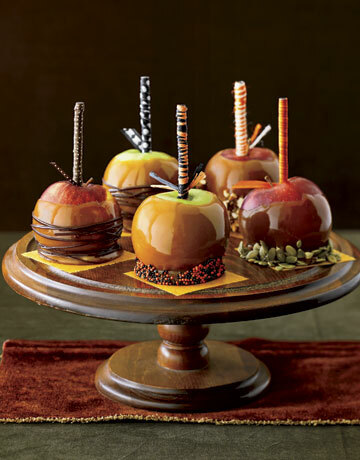 One of my favorite fall treats are carmel apples. This year at our halloween party I think we are going to do a variation of a “Make your own Sundae Bar” with a “Make your own Carmel Apple Bar” I plan to have the carmel melted and ready to go so the kids can dip their own apples – then have a supply of sprinkles, crushed candy bars, chopped nuts, and chocolate syrup so each kid can decorate and top their own apples. I think that sounds like a lot of messy fun! At Country Living – they have some fantastic carmel apples recipes if you’d like to make some of your own including Pistachio Chocolate Apples, Carmel Candied Apples and even good old Traditional Carmel Apples!